Ideal for enclosed spaces and shelters. Safe on plastics, laminates and polycarbonates. Removes adhesive labels. A new generation of graffiti remover which intelligently removes paint off a painted surface. Different types of paint, such as car paint, powder coated paint and gloss paints are chemically different to aerosol spray paints used by vandals. Plastic Safe is formulated to break up aerosol spray paint (without dissolving it) but will not attack the oleo-resinous, polyurethane or powder coated substrate. Also, the product will not attack common plastics including polycarbonate, it has been extensively tested on the Glasdon® range of bins and shelters. 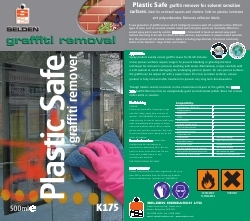 Though Selden cannot comment on the environment impact of the graffiti, this Plastic Safe Graffiti Remover has an exceptionally good environmental profile. Does not contain either acids or caustics. Spray product evenly across graffiti. Leave for 10-60 minutes (more porous surfaces require longer). To prevent bleeding or ghosting the best technique for removal is pressure washing with water. Alternatively, scrape carefully with a soft spatula to avoid damaging the underlying paint or plastic. On nonporous surfaces the graffiti can be wiped off with a paper towel. On more sensitive surfaces, ensure product is fully removed after treatment to prevent any long term discolouration.